The 15-year-old Spaniard advances to the third round of the ATP Challenger event, facing fellow teenager Rudolf Molleker next. 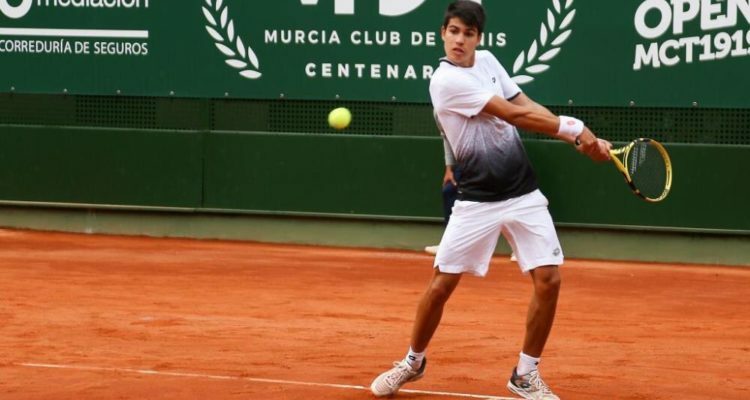 15-year-old Carlos Alcaraz Garfia delighted his home crowd at the Murcia Open by reaching the third round of the €46,600 ATP Challenger clay-court event on Wednesday afternoon. In front of packed stands at the Club de Tenis Murcia 1919, the Spanish teenager defeated compatriot Pedro Martínez 6-3, 7-6(4) in dominant fashion. Alcaraz Garfia saved four of the five break points he faced, capitalizing on two of his own three chances to prevail after one hour and 46 minutes. The Murcia native has become the youngest competitor to beat a Top 200 player since Rafael Nadal in 2002. He advanced to the stage of the last 16 at Challenger level for the first time. Alcaraz Garfia will next take on 18-year-old Rudolf Molleker, who emerged victorious from the battle of the generations with Spanish veteran Tommy Robredo, winning 6-3, 4-6, 6-2. The World No. 170 from Germany outpointed his opponent 101-95 after two hours and 10 minutes. With No. 14 seed Mikael Ymer another NextGen ATP player will appear in the third round. The 20-year-old from Sweden edged past Jan Choinski from Great Britain 6-2, 6-4 to take on Raul Brancaccio next. The ITF-entry of Italy knocked out No. 3 seed Thiago Monteiro from Brazil 4-6, 6-4, 7-6 (1). The encounter lasted two hours and 29 minutes. Later in the evening and after a short rain delay, Nicolas Almagro‘s doubles career has also come to an end. The 33-year-old Spaniard, who played his last singles match on Tuesday, lost alongside Juan Antonio Marin from Costa Rica to Ariel Behar of Uruguay and Italian Andrea Vavassori 6-1, 6-3 in 56 minutes. This entry was posted in ATP Challenger Murcia, ATP Challenger Tour and tagged ATP Challenger Tour, Carlos Alcaraz Garfia, Murcia Open.